The grand opening of the new outlet mall in greater Vancouver, Tsawwassen Mills. 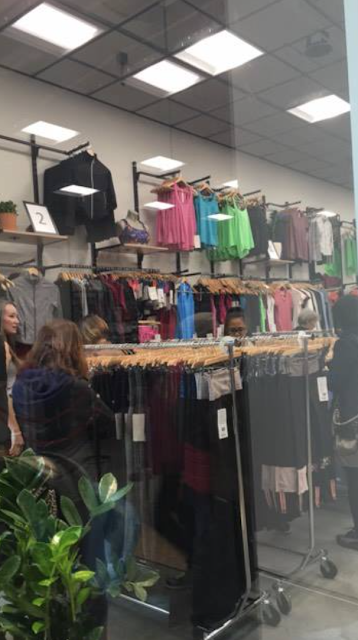 This is the third Lululemon Outlet location for Vancouver, the other two have been closed down for years. 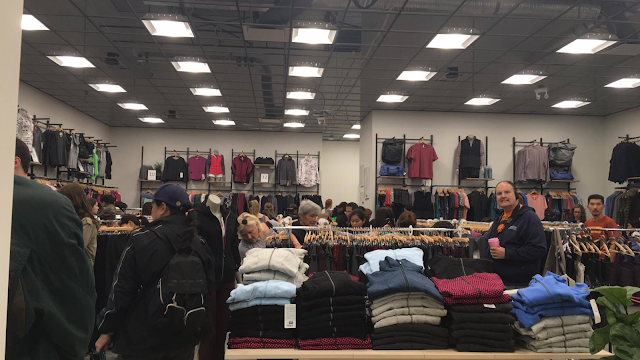 Hopefully this location gets a lot of inventory but so far it’s looking like the US Burlington outlet is the better option as far as selection for Vancouverites if you don’t mind the currency exchange issue. $19 a swiftly! I'm jealous. We need one in Alberta! Wish there was one in Ottawa Ontario! I would love to get some $19 Swiftlies! wow, I was just thinking the other day that Vancouver doesn't have an outlet and I was so upset. Need the check them out asap. does anyone know the opening hours? yeah, I remember the days when there used to be 5-6 items on WMTM and that was all. now at over 100 items I no longer care. I do find that items go to WMTM really fast. I mean I don't mind it because I like a sale. but I know what you mean. and since we talking about markdowns happening close to release date – did you see Lulumum's post about the marble speed tights? they are on markdown already!! this is crazy. they released them like what, 3-4 weeks ago? I know it's new. But my first thought is that it's so much cleaner than the Burlington outlet! Aw man, there are never outlets close enough for me to warrant making a trip. I would totally be looking for some more black or dark tights and if they had one of those black scubas in a 2, I would snap it up no questions asked! I don't think you're missing much in general. $19 Swiftlies sound amazing, but I've been in the outlets in NY and Maine many times and I don't think I've ever purchased anything. It's mostly the most hideous stuff from WMTM. Like the &Go crap with huge holes cut out of the back. The prices are usually the same as WMTM, too. i actually usually find better mark downs at most stores than at the outlets. Maybe I've just been to sucky outlets, but I've been extremely disappointed. This weekend we'll drive by the Maine one, stopping in at Gap and J Crew for my daughter and I don't think I'll even bother to get out of the car at Lulu. I'm tired of hoping for something decent and always being disappointed. Oh man. I always end up with more than I should. Basically almost half my CRBs + RSYBs are from our outlet (Burlington, WA). Plus a bunch of ls swiftlys and my yoga mat. I don't know if I have really good (expensive) outlet-fu or if I'm just lucky size-wise. @Anon 5:04 if it's all that &Go crap, I'm totally fine with never going. That stuff is too weird for me. I rarely buy anything off WMTM except when the occasional "normal" thing makes it there (like the 5 mile LS…), but the things I like from WMTM usually sell out in a matter of minutes. The things that stick around are the ugly things that i never wanted in the first place, haha. I keep hoping they'll open one in Colorado!! I've visited a couple – north of Seattle somewhere and also in South Carolina. Always find something good! But I am a bargain shopper. curious as well. also in van. Mall was beautiful, lots of stores make it worth the trip. Lululemon in particular was pretty hurting, though. 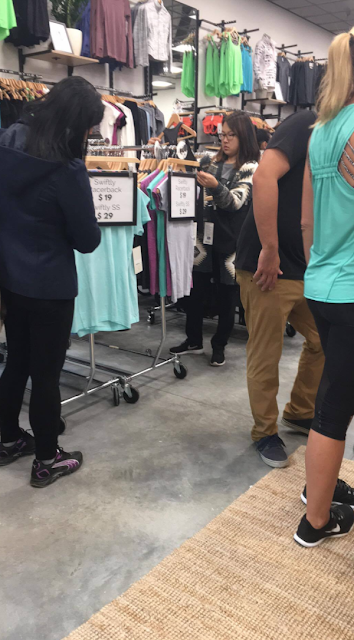 No $19 swiftlets left by the time I got there, almost nothing in a size 10 or 12. I saw a couple no limits tanks that were $49, but was too irritated to pull the trigger (even though they're my favourite for bikram). Outlets usually have a few blow-out items and then overpriced crap, and all that was left was overpriced crap, essentially. A $39 swiftly tank or $49 nlt isn't enough to entice me to purchase. no limits tank?? you mean the one that was discontinued a year or so ago? why they would be selling it now, do they have that many leftovers? I went today, it's in the middle of nowhere! There was a lot of inventory, but mostly stuff that was on WMTM or older items. I did see some pretty jackets that I didn't recognize (raindrop?) and some puffy vests/jackets, but the deals weren't spectacular. They had a bunch of older winter stuff, so it might be worth going if you need hats, mittens, gloves, scarves etc – it was all at the same MD price as last year. One colour of vinyasa, in a blue/green stripe I believe. Also a decent selection of accessories (bags, headbands, water bottles, etc) and about half the store was men's items. so no swiftlies nor pace rivels? thanks for the feedback! I really don't think it's worth the trip. maybe later on, when it's going to be less busy. I walked on the ferry from Victoria this morning and got the shuttle to the mall and got a $25.00 gift card to spend at the mall. 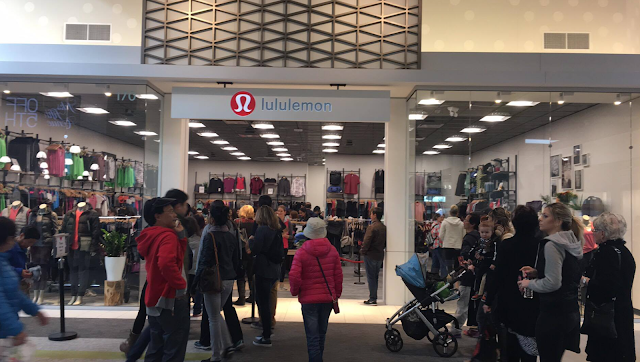 The line outside of Lulu wasn't worth me standing in. Beautiful mall and tons of sales I went for the Mavi and Lucky stores. We spent 4 hours and walked through the whole thing. I'm glad I saw it but, sorry I prefer Metro Town. anyways, the rest was just junk at wmtm prices. a lot of stuff was in prints that were released a year ago. really old stuff.